First weekend in Salzburg is coming to an end with a lazy Sunday spent doing homework and singing along to various Broadway musicals with my theater enthusiast of a roommate. It’s a much needed break seeing as we’ve all been constantly in motion since just about the moment we pulled our bags up too many flights of stairs during move-in a week ago today. We had more German classes on Friday, and for dinner roomie and I decided to try out the canned soup we’d bought during our stressful shopping experience. Mine was noodle soup. Familiar enough. She had bought what we thought was tomato soup. It wasn’t. In fact, we’re still not entirely sure what it was, but she gamely ate all of it. We made plans to go to an open air jazz concert in the old town that evening with some other friends. Of course, in reality, the concert was indoors and hardly jazz at all. After a week of making plans the way little kids play whisper down the alley, this didn’t seem all that strange to us. It was a fun girls’ night out anyway. Saturday some of us hopped on a bus to Schloss Hellbrunn, a castle on the outskirts of Salzburg built 400 hundred years ago and famous for having trick water fountains. It was a nice day by Salzburg standards (72 and sunny!) so we went prepared to get wet. And even though I’d been there before, the castle did not disappoint. We had a brief freak out moment when our tour guide began speaking in German to the whole group (why hadn’t it occurred to us this would happen? ), but he translated his speech into English a few minutes later. All of the fountains and moving scenes in the gardens are water powered, and it’s hard to believe the technology to design and build them existed 400 years ago. 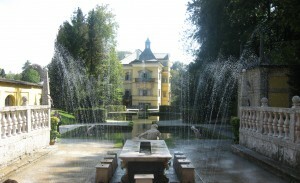 Of course, the castle’s builder had a sense of humor, and many of the fountains are meant to surprise (and soak) guests. I’m quite convinced our tour guide had to have been picking on us. He would consistently wait until everyone except our little group of eight had walked away, and then he’d turn on the extra jet of water aiming straight for us. We ended the tour dripping but amused. After we’d walked around the inside of the castle itself we wandered the park adjacent to the grounds and made the mandatory stop at the Sound of Music gazebo. There was also a festival for little kids going on, so being the kids we are, we petted a pony and painted a car. All of us in the program had the option of staying in an Austrian household rather than a dorm during the program, and our friends Rachel and Kirsten are roommates at the home of the most amusing seventy-four year old Austrian woman in Salzburg. Or possibly anywhere. We’ve only been here a week, but already her food has quite the reputation, and so after Hellbrunn some of us went back with Rachel and Kirsten to have dinner at their apartment. Frau Schoettke called it a snack, but we were greeted by a ridiculous amount of food in multiple courses. We’ve all been eating out or attempting to cook for ourselves for days now, so real homecooked food was much appreciated. She told us (dirty!) jokes and showed pictures and told stories of past students that had come through Salzburg with our program. When we were finally all full to bursting, we headed back into town and found more friends with whom to wile away the rest of our Saturday night. Tomorrow- day trip to Castle Hohenwerfen.